One of the best Summer reads for me last year was Summer Loving by Allie Spencer. 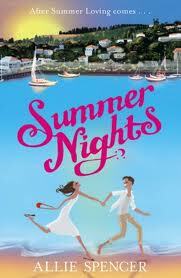 When I was looking through Amazon to see what new up and coming books were coming out I was shocked to see that Allie Spencer was releasing another book this time called Summer Nights. The book covers are very similar and very appealing perfect for a summer read if ever the sun does decide to come out but just remember to be careful you pick up the right book! Flora is holidaying in San Francisco and she is eagerly awaiting her boyfriend’s arrival to join her in celebrating her 30th birthday but things don’t go to plan when he dumps her leaving her alone in San Francisco. With only one option Flora seeks out her cousin Bella who lives in San Francisco but Bella has been keeping secrets from her family when it comes to her job with them thinking she is working as a nurse when in fact she is currently singing in an Abba tribute band. It looks like the girls need each other help to get over the difficulties in their lives. Firstly I was a little surprised by this book as I thought because the title and the cover of the books were so similar I thought it was going to be a carry on from Summer Loving but this wasn’t the case. We are introduced to a whole new bunch of characters all of whom I loved. Flora was easy to warm to after having her heart broken early on in the book although it is quite clear she is upset she doesn’t mope around for long as her cousin Bella and her friend Lisa soon take it upon themselves to cheer her up and encourage her to get back out on the dating scene again. If there are any Abba fans out there you will also enjoy this book as Bella is part of an Abba tribute band and you soon have the songs playing in your mind! I love how light hearted the book felt until a certain point where out of nowhere the book takes an emotional turn which only makes the book more appealing. I love the romance in this book to it wasn’t rushed and it was great to read the build up to the relationship between Flora and her love interest. Another great read from Allie Spencer which will make your perfect holiday read.